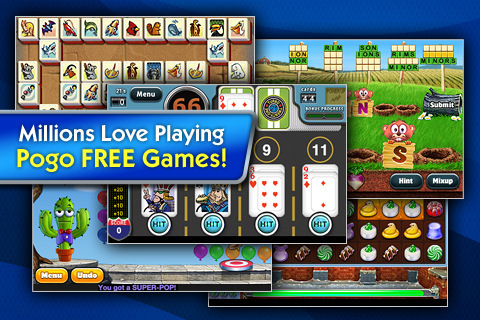 Pogo Games is a free app with five different games offered including, Word Whomp, Turbo 21, Poppit!, Sweet Tooth, and Mahjong Safari. The variety of games was brought to us by Electronic Arts Inc., for an iPhone, iPod Touch, and iPad. To start with Word Whomp, you are tasked with touching gophers to spell out as many 3 to 6 letter words as you can find. The game is perfect for all of you Scrabble fans who are trying to get in a little practice before your big Facebook tournament. You get two minutes and twenty seconds on the clock and in the background is a sort of Wheel of Fortune setup with white blocks attached to wooden poles that give you an idea of how many 3, 4, 5, and 6 letter words there are to guess with the scrambled six letters you are given for that round. Turbo 21 is game that combines the concept of Blackjack with a racetrack. The player is given 4 lanes to use and a 52-card deck. You start by touching whichever lane you want the current card to go into. The goal is to get as many 21s as you can but that all depends on the luck of the draw. Whenever a lane gets to 21 you start over until you have gone through the whole deck. Most of the time you are going to have to bust (go over 21) and start over depending on your planning skills and luck. In Poppit! you are given a wall of balloons of all different colors that you have to pop. You can only pop the balloons if they are adjacent to a balloon or multiple balloons of the same color. Some of the balloons have gifts inside of them that you can use for extra points. Once you pop the gift balloons you have to move a target at the bottom of the page in order to catch whatever toy attached to a parachute has fallen from the popped balloon. The whole scene is regulated by a cactus with a bowtie and vest who gives you pointers on how to win the game. 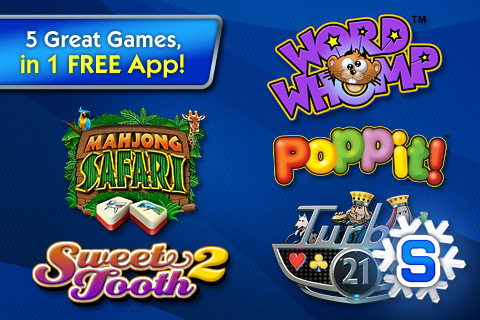 Sweet Tooth and Mahjong Safari are both games that tests your matching skills. Aside from the usual annoyance of having put up with ads every time you load a new page in a free app, I would have to say that it is worth the effort of finding Pogo Games in the app store, downloading it, and adding it to your already cluttered iPhone, iPod, or iPad. For $2.99 you can upgrade this game via In App Purchase to remove all ads. If you are already a member of Club Pogo, just log-in with your account and you get advertisement-free game play. AppSafari review of Pogo Games was written by Vanessa Paszterko on December 11th, 2010 and categorized under App Store, Free, Fun, Games, Puzzler, Strategy, Word Games. Page viewed 4462 times, 1 so far today. Need help on using these apps? Please read the Help Page.